Kidderminster Choral Society performed with six local choirs, alongside their youth choir, Wyre Forest a Young Voices in a charity fundraising event. The concert took place on Friday 10th February at Kidderminster Town Hall. 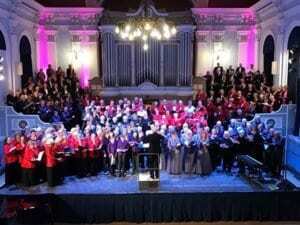 The event brought together all the local choral societies and choirs, and was masterminded by KCS Musical Director, Geoff Weaver. The participating choirs all gave their time and talents to this fundraising concert and sang their very best, in a hall full of other singers as well as a very appreciative audience. The choirs featured besides KCS and WFYV, were Kidderminster Valentines, Bewdley Choral Society, Stourport Choral Society, Viva Musica, Nos Novem and Kidderminster Male Choir. Performing as well was the very talented local Baritone soloist , Alan Fairs. The concert was a resounding success and raised over £2600 for two charities, one local and one overseas. The local one is Mentor Link, a Worcestershire-based charity which provides counselling and support to local young people in need. The second charity is Mandalay School for the Deaf, in Myanmar (formerly Burma). This charity was set up over 50 years ago by Sandy Blakeway-Smith, the wife of KCS member David Blakeway-Smith, who sadly died just before Christmas, having done so much in the past few years to ensure adequate support for the school. Not only was this a fantastic fundraising evening, it also gave all the choirs a rare opportunity to hear and support each other. The evening finished with all eight choirs on stage, totaling almost 200 singes, in a magnificent massed choral performance of Handel’s Hallelujah Chorus.